The tower will be built over the same land where Bungalow and Container Bar sit. AUSTIN, Texas — There's a lot to say about Rainey Street, from its unique Saturday night vibes to its colorful bars and restaurants. But it's had a front-row seat to the massive growth of Downtown Austin. In recent years, the high-rise towers have finally made their appearances on Rainey Street. Another one is in store now. A 51-story building with apartments and a hotel will go up on 90 through 92 Rainey Street. Construction won't happen for another few years. Kevin Burns, the CEO of Urbanspace Real Estate and Interiors, is the developer of the new building, and he said he's excited for the future. "I truly believe Rainey Street is one of the jewels of Austin – it’s unique, it’s special, it’s different," Burns said. "One of the things that's really important to me, as I help evolve Rainey Street, is to make sure that I don't kill what's so special about Rainey." Some of those specialties for the street are the popular bars. Right now, Bungalow and Container Bar are on the property where the high-rise is to be built. While it would appear the Saturday night hotspots would meet their demise, Burns is keeping the bars in the plans, putting Container Bar on the first floor of the new building and Bungalow on the second floor. Of course, Austinites have mixed feelings about this. "If you wanna build skyscrapers for the fancy-shmancy people, that's fine, I'm not a hater," Terrence Stith, a 14-year Austin resident, said. "But, I think there needs to be a balance where affordable housing comes with that." Burns said affordable housing units are in the picture, and that the high-rise will only benefit the pedestrian experience. 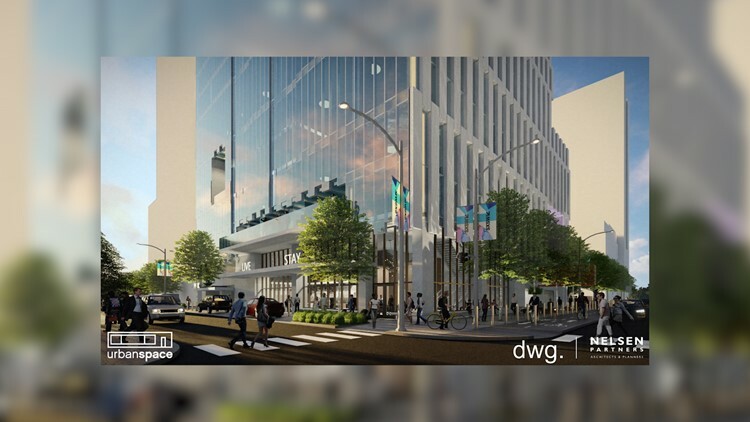 “To be able to put another 290 apartments where people can walk to work and to put a hotel where they can walk to the convention center and walk to the bars and nightlife versus having to drive, that just helps everybody out," Burns said. Nevertheless, Stith said other issues should be addressed when it comes to a project of this size. "Build some mass transit that can improve the quality of life, that will allow it to be maintained for such a massive amount of people moving here," Stith said. The bars, of course, will stay open until construction starts in a few years. Then, they'll reopen after completion.